Thinking of Woody Guthrie, and Listening too. Woody was born 100 years ago today, on July 14, 1912. This may be his best known song, one that is cherished around the world. And here’s something that’s not as well known, but great to listen to. Woody left behind thousands of complete lyrics to songs that were never set to music. After she heard him perform a tribute concert for her father, Nora Guthrie, hired British musician, Billy Bragg, and the American band, Wilco, to set the songs to music. 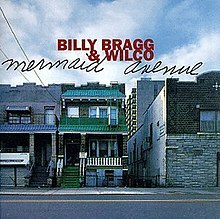 In 1998 they released a first album called Mermaid Avenue, and a second in 2000. This entry was posted in Culture, Music and tagged Billy Bragg, Culture, Mermaid Avenue, Music, Woody Guthrie. Bookmark the permalink. 1 Response to Thinking of Woody Guthrie, and Listening too. When I saw the article on Guthrie’s birthday in the SacBee, I said to myself, I bet I know what will be the subject of Morgan’s next post. We grew up with his music, so I enjoyed this walk down memory lane. You are right, though. I had never heard of the new songs. Thanks.